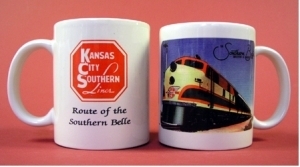 The Kansas City Southern Railroad operated the famous Southern Belle between Kansas City and New Orleans. 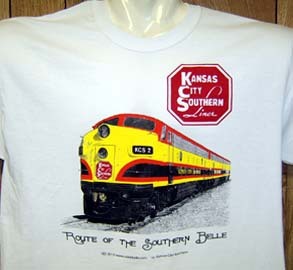 The Kansas City Southern Railroads heritage F-unit diesel KCS-2, The Meridian. NOTE: Printed on a CHARCOAL color t-shirt. 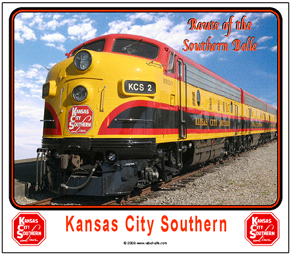 One of the latest widebody diesels of the Kansas City Southern Railroad in beautiful heritage colors. 6 inch x 6 inch square tin sign of the Kansas City Southern Railroads Flying Crow passenger train logo. 6 inch x 6 inch square tin logo sign of the Kansas City Southern Railroad. 6 inch x 6 inch square tin logo sign of the Kansas City Southern and Louisiana & Arkansas Railroads. 6 inch x 6 inch square tin sign of the Louisiana & Arkansas Railways Better Way Logo. A very rare logo. Now part of the KCS Railroad. 6 inch x 6 inch square tin sign of the Louisiana & Arkansas Railways Hustler Passenger Train Logo. A very rare logo. Now part of the KCS Railroad. 6 inch x 6 inch square tin sign of the Louisiana & Arkansas Railways Shreveporter Passenger Train Logo which ran between Shreveport and Hope, Arkansas. A very rare logo. Now part of the KCS Railroad. 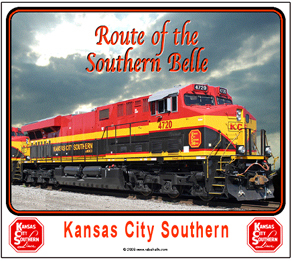 Beautiful Kansas City Southern executive heritage F-Unit diesels. Shown is the Meridian. Beautiful Kansas City Southern widebody diesels in heritage color scheme. 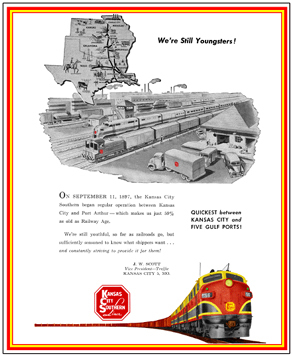 An old Kansas City Southern Railroad advertisement promoting its excellent service between the mid-west and the gulf ports and points along the way.